Botta/Cucchi is a poster for an exhibition at the Museo Cantonale d’Arte in Lugano, Switzerland, about the collaborative project for the Santa Maria degli Angeli chapel by the architect Mario Botta and the painter Enzo Cucchi. The chapel, commissioned by Egidio Cattaneo and dedicated to his late wife, is on Mount Tamaro and is only accessible by cable car. Botta chose the mountainside location for its spectacular views of the Swiss Alps and the valley below. Monguzzi was born in Mendrisio, in the Ticino region of Switzerland, in 1941. He studied graphic design at L’Ecole des arts décoratifs in Geneva and with several designers in London, and spent part of his early career in at the studio of Antonio Boggeri, in Milan. At Studio Boggeri, Monguzzi learned how to fuse the two cultures of his heritage: the Swiss (logical and constructive) and the Italian (poetic and anarchic). The experimental and visually-daring work of the avant-garde designers Herbert Bayer, El Lissitsky, Jan Tschichold, Piet Zwart, Paul Schuitema, Ladislav Sutnar, Theo van Doesburg, and Kirill Zdanevich were vital inspiration to the development of Monguzzi’s typography and designs for a dynamic graphic language. After two years at Studio Boggeri, he worked independently for a period and was soon asked to teach courses on typography at the Giorgio Cini Foundation in Venice. In 1965, he moved to Montreal in order to design nine pavilions for the Expo 1967. In his designs for the pavilions, Monguzzi applied ideas about three-dimensional structure and perception as a way to meet the challenges of both creating universal forms of communication as well as contextualized environments for an international audience. In 1968, he returned to Milan, where he established his own design studio. In 1971, he received the Bodoni Prize for his contributions to Italian graphic design. That same year, he relocated to southern Switzerland and joined the faculty of the Lugano School of Design to teach courses in the psychology of perception and typographic design. From 1986 to 1991, Monguzzi served as art consultant to the architecture and design magazine Abitare, published in Milan. Monguzzi’s work on the graphic identity and visual communications program for the Musée de Orsay in Paris (1986) led to his work for the Museo Cantonale d’Arte. After winning a competition to design the identity and signage for the Musée d’Orsay (1983–86), Monguzzi was commissioned in 1987 by Manuel Kahn-Rossi, director of the then new Museo Cantanale d’Arte, to design the museum’s logo as well as all of their visual communication materials. Monguzzi’s graphic production for the Museo Cantonale d’Arte, the primary cultural institution for the Ticino region of Switzerland, is regarded as among the chief achievements of his career. Bruno Monguzzi, Bruno Monguzzi: cinquant’anni di carta = fifty years of paper (Milan: Skira, 2011), 5. 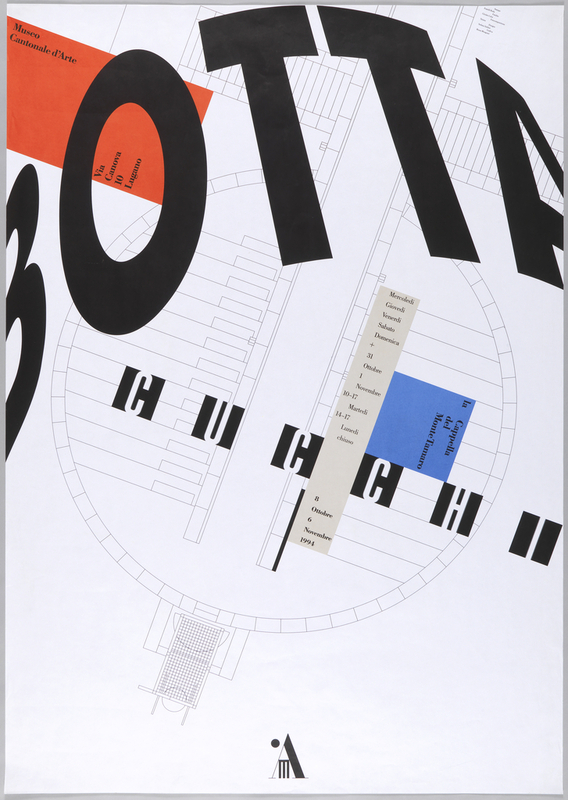 Poster, Botta/Cucchi, Museo Cantonale d'Arte, Lugano, 1994. lithograph on wove paper. Gift of Bruno Monguzzi. 2009-14-1.